Pedro Padierna, CEO of PepsiCo Mexico, has a simple, clear, and focused philosophy for his company: “Win with diversity and inclusion.” In Padierna’s mind, his most important responsibility as CEO is to unleash his employees’ potential and create an inclusive work environment to empower individuals from diverse backgrounds. Padierna began developing an appreciation for the value of diverse ideas as a grad student. After graduating from the Iberoamericana University in Mexico City, he came to the United States to get his master’s degree at Tulane University. Studying outside of his home country under the Fulbright Scholarship exposed him to new cultures and new processes, and provided him the ability to amplify his professional vision. Padierna experienced first-hand how people from different backgrounds could foster teamwork in order to reach common goals. “My academic experience provided me a wider perspective to reinforce my strategic thinking,” he says. Padierna started his career at PepsiCo in 1987 as a VP in marketing and later in research and development at Sabritas, a beloved Mexican food brand of snacks owned by PepsiCo. He proceeded to hold several roles across various PepsiCo sectors and was eventually promoted to take the helm of the company in the country, as president and CEO of PepsiCo Mexico for its foods division. “The first thing I did was thank and congratulate my team. Promotion wasn’t a direct consequence of my work, but teamwork,” he says. Padierna asserts that the majority of his time is devoted to developing a team of diversely talented people. And the proof is in the pudding; over the past five years, PepsiCo Mexico has developed a variety of initiatives to empower women, from front lines in production plants, to sales force, and all the way up through management teams. His passion for innovation and opportunities for employees prompted in 2013 with the creation of the company’s Pink Line project at the PepsiCo Vallejo Biscuit Plant in Mexico City. Its purpose was to promote women to roles and positions previously thought to be performed only by men. The line is now comprised of 60 packaging positions, four operators, and eight palletizers—all women. By encouraging the leadership to support talent development programs and challenging emerging leaders to think strategically, business investment and growth naturally accelerates. “We promote innovation, transformation, and bold goals among people from all generations—millennials to seniors—to unleash the potential of teamwork,” Padierna says. Pedro has a deep commitment not only with employees, but also with communities and academic development. Serving on several not-for-profit boards and business associations is a must in his professional and personal path in order to give back to society as he does as president of the board of trustees of the Iberoamericana University, his alma mater. 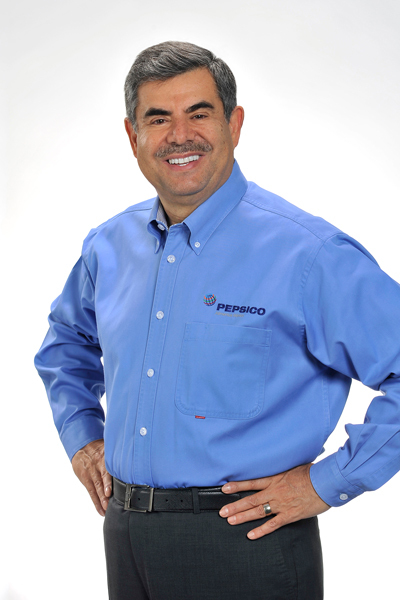 PepsiCo Mexico will continue to increase its focus on strengthening the agenda of diversity and engagement, promoting education, training, mentoring, and inclusion, according to PepsiCo’s sustainability strategy, Performance with Purpose. Implementing the strategy means that numbers have to be delivered, while making sure the company is sustainable for the future by providing a wide range of foods and beverages, finding innovative ways to minimize the impact on the environment, reducing operating costs as well as providing a safe and inclusive workplace for employees globally. “Diversity and engagement are critical,” he says of his priorities. “I believe that having a successful company in the long-term implies having people from different backgrounds, ages, preferences, and gender.” He has found that by promoting that philosophy, PepsiCo Mexico has been able to recruit top talent and incorporate different points of view that enrich the company’s perspective and connect it to its consumers.